Get notified automatically whenever you have idle leads in CRM! You depend on leads to grow your business. As you follow up with a new bunch of new leads regularly, you often forget about the ones that did not yield a positive response the first time you contacted them. Over a period of time you tend to accumulate a lot of such idle leads in CRM. But these leads, if followed up a second or third time might give you potential deals. You can make it a rule to follow up with leads again if they have remained idle for a long time. It is a laborious process to filter out these idle leads, but here is a quick tip to solve this problem. Click Settings > Setup > Automation > Workflow Rules. Under the Create New Rule popup, choose Record action, select Field Update and pick the Lead Statusfield. Under Which, choose All Records. Add a Scheduled action to be executed 14 days after the Rule Trigger Time. To this, associate a custom function as seen in this image. 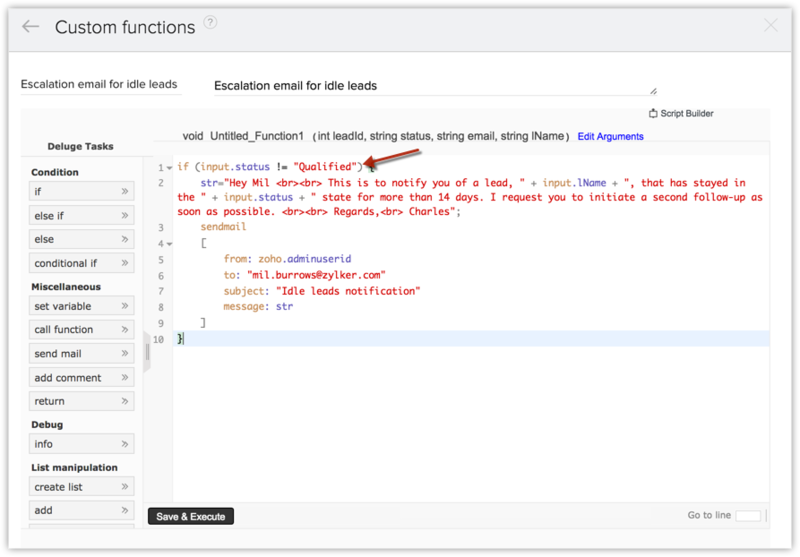 After setting up this rule, if the Lead Status field is updated, the email as configured in the custom function will be automated 14 days from the date of modification (rule trigger time). Note: The criteria (input.status != "Qualified") ensures that the scheduler does not automate the escalation email once the lead has reached the end state. Example, you wouldn't want an escalation email to be sent in the case of qualified leads. So, you can exclude the "Qualified" status from the workflow rule; this way, the rule is executed only for records that have remained in other states for more than 14 days - such as Not Contacted, Junk and so on.